French wildlife and beekeeping: Honey bees are wild, it really is that simple. Honey bees are wild, it really is that simple. There seems to be a large number of people in the bee keeping world that can’t get to grips with the fact that Honey bees can and do live quite contentedly without the assistance of Human beings and have done so for some 300,000 years managing the ups and downs of disease and ice ages. Insects really don’t need us to manipulate their life processes, they just require suitable habitat and living conditions and Honey bees are no exception to this, but already I hear the cries of outraged bee fiddlers everywhere accusing me of bad management, spreading disease and worse. * Clipping the Queens wings to prevent them from being able to fly when the colony attempts to divide and swarm. * Opening the hive on a regular basis, normally every 7/8 days in the season, removing the frames of comb to check for signs of diseases and for any Queen cells that are made prior to swarming. * Should Queen Cells be found it is fairly common practice to destroy all but one or two or in some cases all of them. 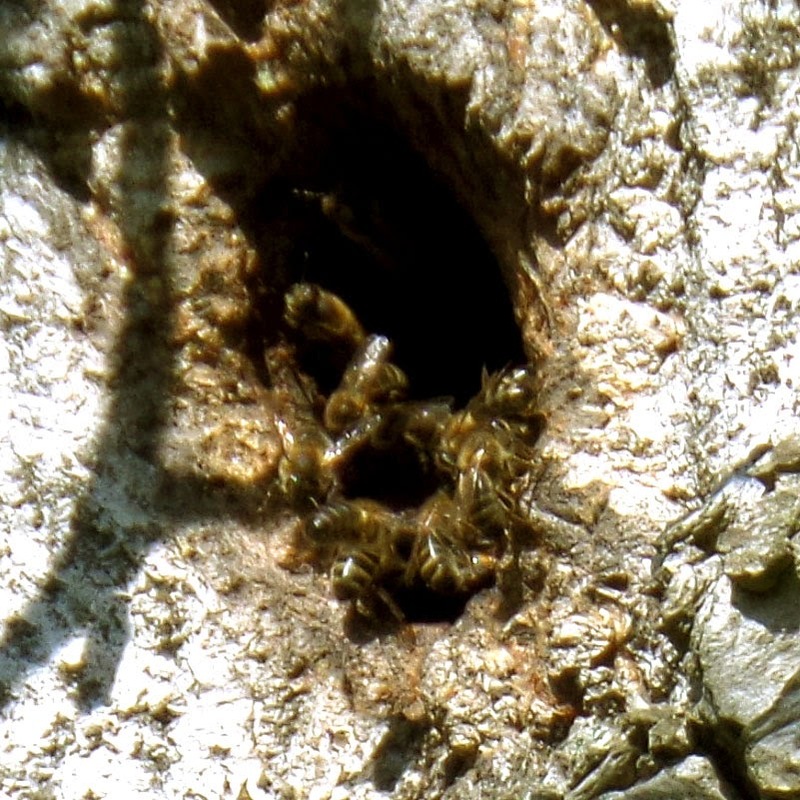 (The bees will make perhaps 10 – 15 but will normally only allow one or two to hatch, the others are insurance). * Regularly destroy Drone cells and larvae to reduce the number of varroa mites; there is a special tool for this – a Drone comb. * Use Plastic pre formed honey comb. * Using various insecticide treatments in the hive to kill varroa mites. * Regularly removing old Brood comb and replacing, usually with a frame of new wax foundation. * Transporting hives with bees from one location to another for forage. * Feeding the bees with artificial pollen substitutes often made from soya flour. Granted not all mainstream keepers use or practice all of these methods but weekly removal and inspection of colony frames much of the year, varroa mite control and swarm prevention are considered to be necessary for colony survival and preventing the escape of colonies into the wild. My perspective on this that puts me in the naughty corner is that I simply don’t think it is right or necessary to treat bees using any of these products or methods. I’m happy for my bees to swarm, in fact it’s a marvel of nature and although it takes time I enjoy swarm collection and hiving them. I never have any health issues with my bees, and yes, I would know and I’m certainly not of a mind to use insecticides in my hives whether they are synthetic or so called natural. Contrary to the popular view Honey bee colonies don’t die or fail when left alone or I should say that they don’t fail anymore than would be naturally expected. The only disease that is considered to be serious in France is American Foul Brood which isn’t very common and is mainly spread by bee keepers using infected equipment or selling infected stock. Much is made of replacing old comb with new wax foundation, but if left to themselves they manage the comb by removing any that is no longer fit for purpose and replacing or restoring as required, something they have always done. Many keepers talk of hives becoming too full of honey or too full of brood but again the bees will manage this if they are of local stock although maybe not to our maximum profit. For the time being how a person wishes to keep and manage their bees is still a matter of choice here in France, (and the UK), but as always there is a vociferous body of people that would impose their views and methods on everyone else. This short video, made 14.04.2015 shows one of my hives that has been completely free of interference for 8 years. The brood frames have never been touched, looked at or fiddled with. The hive has been allowed to swarm and produce their own new Queen each year and as can be seen they are healthy and industrious with the “air conditioning on”, (the bees upside down fanning at the entrance). If you watch carefully you will also see one or two bees exiting the hive with debris in their mouths that they are cleaning out.